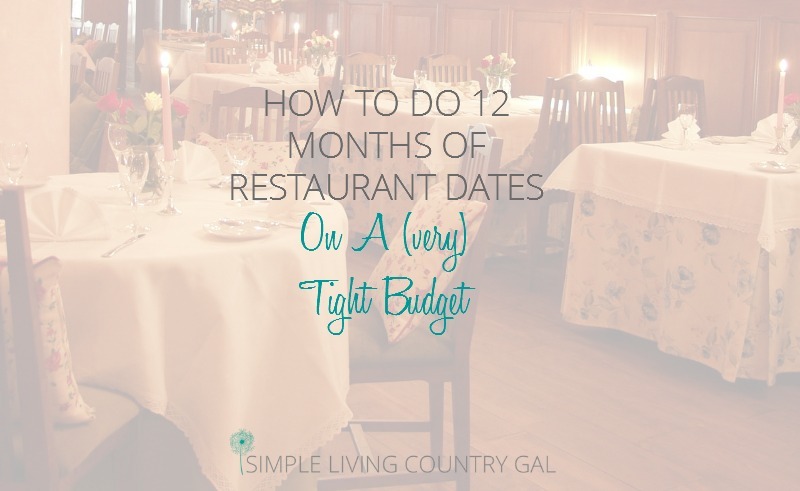 This post will show you my best frugal living tips so you can afford to eat out every month even on a tight budget. Hubs and I have this love of restaurant food. What can I say? There is nothing more wonderful than having food made on command, brought out to piping hot, drink glasses that are filled without being asked, not having to clean it up afterward, and the best part…unlimited amounts of fresh bread. Oh ya, I’m all over that. When you spend your days surrounded by animals it is nice to go out with real people every now and then. Sometimes a girl needs a reason to put on makeup. Unfortunately, going out to eat anymore can cost a small fortune which is not something that goes well with frugal living. Seafood platters starting at $19.99….for ONE PERSON? Are you kidding me? I can feed my entire family for half that! A couple of years ago we decided to give each other 12 date nights for Christmas. That would mean a guaranteed date every month for a year. A great idea in theory, but hot so easy to do on our incredibly tight budget. Unfortunately, purchasing 12 gift cards in one shot can be incredibly expensive even if it is only for two people. 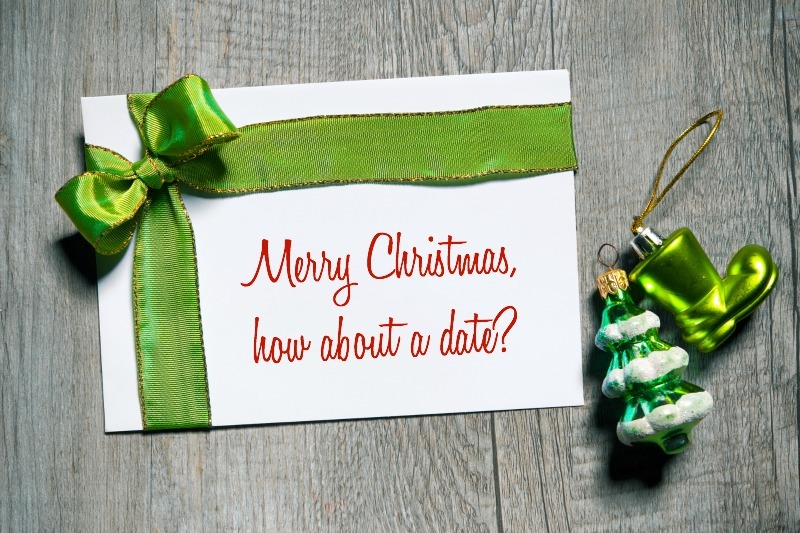 Since we live pretty frugally and are always on a tight budget, we needed to get creative on how to actually pull off such a gift without having to take out a second mortgage our home. Each year we aim to purchase 6 $50 gift cards and 6 $25 gift cards. As you can see, this can be a little tricky, but it CAN be done. I have found that shopping online saves me quite a bit of money. By staying out of the stores I am able to stick to a pretty tight budget. Today with so many online stores offering free delivery it only makes sense to do most of my shopping this way. This way I am not tempted to purchase things that I not only don’t need but also can’t afford. Another perk to shopping online is most sites can be found through a reward site. A reward site is simply a member only site that you visit PRIOR to shopping at an online store. For each dollar, you spend you are rewarded with a point. After you have so many points you can turn them in for cash, rewards, or even gift cards. I like to bank my points until I have enough to purchase a good supply of gift cards all in one shot. Last year, for example, I was able to redeem my points for 4 $50 gift cards to our favorite restaurants. Who knew that shopping could actually help us to afford to eat out! That’s 4 of the big cards right there kids and easy to do even if you are living frugal! With so many reward sites out there everyone will naturally have their favorites. My top two reward sites are MyPoints and Ebates. MyPoints and Ebates are FREE membership sites that will give you points for each dollar spent. They also have many coupons you can use to save even more. MyPoints also has videos you can watch and surveys you can complete to earn even more points. The best part is MyPoints has printable coupons you can redeem when you grocery shop. You get points for printing AND redeeming your coupons which is another unique perk of this company. 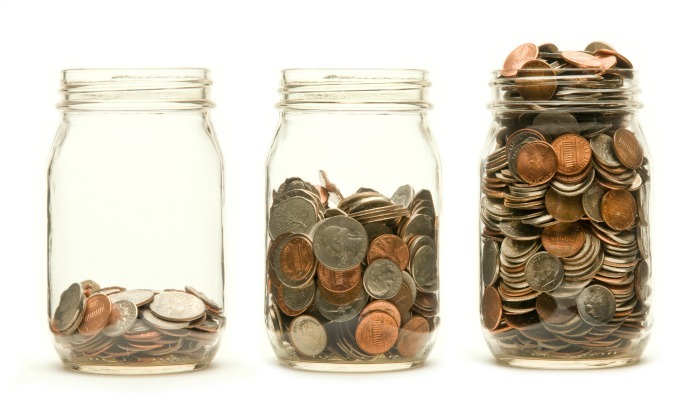 Tip #2 Save your pennies. I LOVE this one and if you are all about frugal living you might already be doing this. It just amazes me how quickly our change can add up. We were each able to purchase two $25 gift cards with our change alone. Our cars, my purses (oh, that’s why they weigh so much), next to my washer and sometimes in my washer, the dish on hubby’s side of his closet (just between you and me, he has LOADS of change there! ), coat pockets and my junk drawer. Each year in November I gather up all the change, roll it up, and take it to the bank in exchange for cash. Do not be tempted to pay one of those automatic machines to count your change. Stop at the bank, ask for coin wrappers (they are usually free, if not try another bank), head home and wrap that coin yourself. Every penny counts if you want to afford to eat out on a tight budget so don’t choose to pay to have your change counted. Sometimes when I need extra money I will take a look at my grocery budget. Even though I spare very little on our food bill I can always find ways to cut even more. My goal is to spend $10 under my monthly budget so by the end of the year I will have $120 to purchase gift cards with. Since I pay cash for my groceries I simply take $10 out and tuck it away in an envelope. This is a painless way we can afford to eat out every month. Another phone app that helps me afford to eat out and one I am loving is Ibotta. Ibotta is a FREE app you install on your smartphone. You can download rebates and coupons to just about anything for just about any store. I have saved hundreds of dollars with this one app. For a limited time, you can get $10 just for signing up! And signing up is easy, just follow the steps below. Remember these are not coupons you need to use in the store. You just choose the ones you want, go and do your shopping, once home take a picture of your receipt and the money goes right into your account. At the end of the month, you can roll over your points or redeem them to a gift card. So crazy easy!! How to set up and use Ibotta. Friday’s, O’Charleys, Olive Garden, Panera Bread and Red Lobster are just some of the few restaurants that over discounts over the holidays. Just this past year you could get money off or even additional $5 gift cards. With so many people shopping online, stores and restaurants need to get creative to get our business. Why not take advantage and save so you can afford to eat out? Another Black Friday promo in our area is “Buy one get one at half off”. This is a local only deal but not only in our area. You might just be surprised at what the mom and pop stores offer over the holiday season. Hey, they want your business too! Sign up for Facebook pages of local restaurants you love and you will see any special sales that you will be able to take advantage of. Okay, this tip is brand new but it is quickly gaining popularity. More and more banks are giving points when you use your debit card to make purchases both online and in stores and when you use it to pay bills online. These points can also be redeemed for gift cards. What stores or restaurants are available will depend on the bank. Simply visit your bank’s website or call to see if this is something they offer their customers. This tip is only for the super disciplined. I am not a fan of credit cards since they were the reason we got into our debt mess in the first place, however, if you can keep your use only to paying bills such as your utilities you can get points for those purchases. And, you guessed it, those points can then be redeemed for even more restaurant gift cards. Just make sure you pay the balance off at the end of every month. As you can see with just a few tricks, a couple of free phone apps, using my top reward sites and taking advantage of sales and points you can get enough gift cards to cover a year of meals for you and your family for a fraction of the true cost. It’s a wonderful holiday gift that everyone will love. Just because you are on a budget doesn’t mean you can’t have fun. Being thrifty is all about being creative and it is amazing to me how each year we find ways to make something out of nothing! The holidays don’t have to break the bank if you learn a few tricks and take advantage of some amazing deals so you can afford to eat out every month. 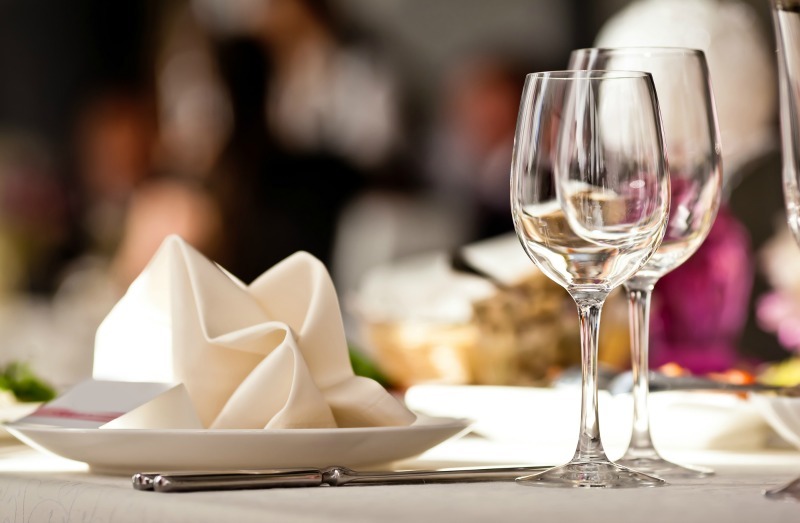 What frugal living tips do you have that might just help you afford to eat out this holiday season? « Unique Gifts For Men and Unique Gifts For Women – Ideas For The Impossible To Buy For! I think this is a great idea, and a very sweet suggestion to newly devoted couples!